ProDen PlaqueOff for Animals is a product that I’m very excited to introduce to you. It started several months ago after a visit with the vet to realize that one of my dogs had unnoticeably lost 4 teeth. We were very lucky to find out that no infection resulted from this event. I was delighted to find a Swedish all-natural product that not only helped with plaque, but also bad breath and tarar. ProDen PlaqueOff is an easy to use, safe, comprehensive powder that I add to all of my dogs food each day. Contrary to other products that rely on chewing, friction or topical application, PlaqueOff is ingested and works itself back into the dog’s saliva, breaking down and preventing the bacteria biofilm that forms on teeth and gums. I’ve been using this product for a over 4 months now, however I noticed a difference in my dog’s teeth and gums within weeks! To use, I simply take the enclosed scoop and add the PlaqueOff to my dog’s food. One bottle seems to lasts forever! The ingredients are all natural with no additives, soy, wheat, gluten, animal proteins, alcohol, zinc, enzymes, or xylitol. It’s base ingredient is seaweed. Myself, along with other veterinarians, breeder and show dog owners have recommended this product and it carries a 100% guarantee. If you’re tired of wrestling with toothbrushes, sprays or putting your fingers in their mouths, you will soon be able to pick up a bottle of PlaqueOff in our store. Look for it towards to the end of March! 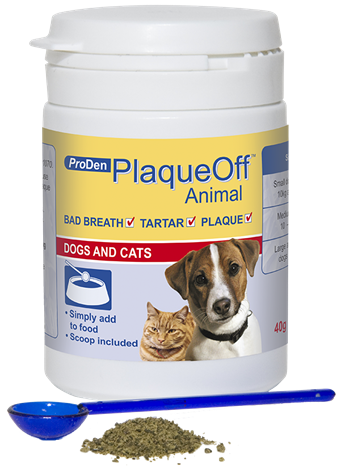 ProDen PlaqueOff® should be used once daily and can be added to wet and dry food. Follow the recommended dosage. Mixed in, or sprinkled on food. How quickly the bad breath and tartar decreases may vary. If the desired effect is not experienced after 2 months you can increase the dose. Then try to reduce the normal dose when the effect has been attained.